By the end of the year I will have travelled overseas 5 times. Italy, Africa, and the Netherlands. I also go to Salt Lake City (SLC) every month with Sam for 10 days to join Greg, who works there half the month. I don't know anyone who travels as much as do at this point! Needless to say that I pack and unpack A LOT, and can put together travel capsules in my sleep. I don't share my SLC and travel capsules on the blog anymore because I think it's boring my readership by now. But for those still interested, this is what I am about to pack. See Pic and Finds. EXACT items, and I don't stray from this capsule at all. It's 100% AUTHENTIC, apart from toiletries, electronics, snacks, a cashmere blanket, wardrobe basics, and prezzies that I pack too. It will be a warm Spring in South Africa (72 to 82 during the day. Cooler at night). Feels like a Seattle Summer. I packed my Spring clothes. We'll be hanging with Greg's parents and his family in a quaint and raw beach town. Monkeys in the trees. Really. Popping things in the hold - no carry-ons. We can do laundry, but probably won't - although I will wash my travel outfit. I don't hike or workout when I travel. Can't believe I'm taking one handbag - but decided to go light. Sam is a little more into helping this time. Leave tomorrow afternoon. Sam will hold the fort at home with the Sam Sitter. What a gorgeous capsule and so you, Angie. Love blush with citron. Also very glad to see your little helper is back to his duties :). Have a wonderful and safe trip! Beautiful colors! Poor Sam. I hope you have a wonderful time. 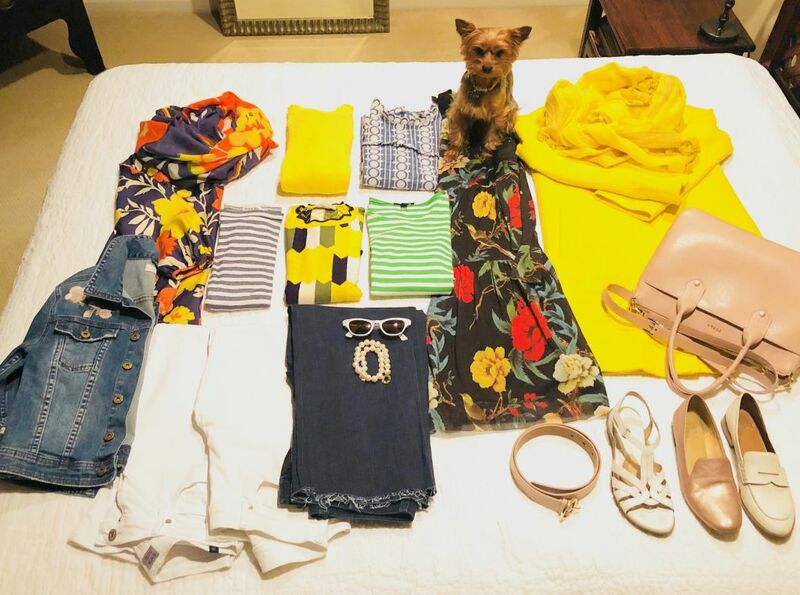 I know how much you love your Summer clothes - this trip must be fun to pack for. Hope everything goes well, and that you enjoy some downtime! Master class for travel and packing, you are really fantastic, but I think without your helper, back, you wouldn't succeed that. Lisa p, dead right about my warm weather clothes, and thanks for the gracious comment. Mirjana, I can't go wrong with Sam's approval. Good thing he got back into it. What lovely colours,they will look just right under an African sun,Safe journey to you both. What a great travel capsule! Safe travels, and have a wonderful time with Greg's family! I'll be a few weeks behind you. Haven't even started to think about what to pack, but I guess it will be getting into summer-ish temps when we are in Cape Town. Fortunately, from what I've seen, it's the kind of summer I like -- warm days and cool nights! Give Sam some extra scratchies and hugs from us too. I know it's hard to leave our furry family members behind, and it's the only part of our trip that has me a little anxious, as Sophie is getting old and I do worry about her. Fortunately, we have wonderful house- and pet-sitters! Sam will be fine with his Sam-sitter! As I try to think about what to do with my life post kids, winding down of 20+ year career and looking for new opps, it occurs to me that you have the lifestyle I'd love to emulate! Job you love that is not location-specific - tons of work but with tons of flexibility, travel (regular and occasional) to some of the best places and of course, happy family, human and furry. Thank you for sharing so much of it with us so we can live vicariously through you. Don't you find that the more you travel, the more efficiently you pack and travel? When I have long stretches without packing a suitcase, it is so difficult to get myself back in the swing of it. Bon voyage! Look fwd to Dubai and S Africa pics. Safe travels, Angie and Greg! Your capsule is lovely as it always is. I cannot imagine the monkeys on the trees part, it must be really nice. I can imagine the beautiful birds though. What a superb travel capsule, Angie! I love your travel capsule posts and this one is fantastic, again. SO MANY gloriors outfit options out of a rather small suitcase, I am impressed and taking notes. Love the bright primary florals. What a contrast with the black and tan travel outfit! Safe journeys and a happy family visit to you both. Your travel capsule posts are NOT boring! They are super helpful and informative, and very inspiring. Have a great trip lovely Angie! Safe travels Angie, from a fellow traveler. We were in Africa a little over a year ago and have such fond memories. Your beautiful brights will be perfect! Enjoy every moment. And BTW, we are NOT bored with your travel capsules ( I’m sure I can speak for the other fabbers. ) We LOVE them and always learn a little something new from each one. Fun colors in your capsule! I hope you have a fun trip. Those are long flights! wonderful travel capsule! have a great trip! Yet another perfect travel capsule! What a vibrant travel capsule! And you will need it with that long journey. Wishing you a wonderful holiday and a good family visit. Bon voyage! You are a busy bee for sure! Fab travel capsule as always. Have a great trip and try to RELAX! Great capsule. Have a wonderful trip. Love the colours you have chosen. Loving all your citron yellow! Hey, it’s just like travelling from Australia to just about anywhere! I understand the water shortage crisis in Cape Town has eased a little, which is good news. Part of our country is also in severe drought and Australians have been following that story with concern. Bored??? Never! You are a ray of sunshine wether or not you’re sporting yellow. Be sure to take care of yourself. Wow, that IS a long time in a plane! I don’t think I’d ever find your travel capsules boring; I always learn from them. Have a wonderful and safe time, and I hope we can see some pics. Have a wonderful trip and take lots of photos to share - including your outfits which we all miss.I for one do not find your travel capsules boring as they are always tight, cohesive and evolving with your style. I read many books, then watched a lot of really bad movies on my recent overseas triple flights. My standards disappear completely. Did they really need to remake Laura Croft - Tomb Raider? Have a wonderful trip! Sam will be fine and so happy to see you when you return. Given that so much of your trip is taken up with travel it makes sense to go a bit light. You will look gorgeous in the South African sun. Oh, that Sam! Too precious. Beautiful capsule as always (need to say?). I am sure Greg's Mum will appreciate very much your beautiful floral prints and all that merry yellow. Safe travel and have fun!